Merchant to Merchant takes Palm Beach! If you’ve been following our podcast for the last year or so you’ll notice that we’ve been taking it on the road and what better place to go than our home away from home Palm Beach, Florida. 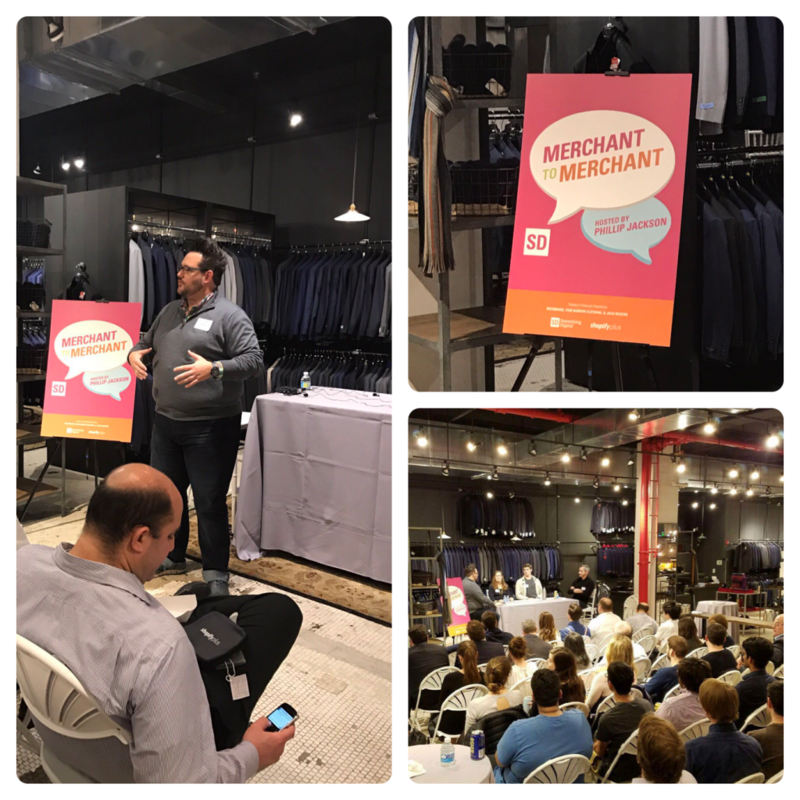 Merchant to Merchant is a live event where merchants gather on a panel in front of an audience of their peers and discuss challenges. We hold these events in an actual retail space – where commerce happens. We met live at the Island Company store on Worth Avenue in Palm Beach, FL to talk to three commerce experts – Kroger Digital, Sandow Media, and surefoot. Each one has a story of transformation, growth, and successfully engaging with customers who have so many options. What better way to kick off 2019 than with a Merchant to Merchant event in Los Angeles? We kicked off 2019 with a live M2M event in Los Angeles and we’ll continue to take it on the road for 2019. For those who aren’t familiar, Merchant to Merchant is a live event where merchants gather on a panel in front of an audience of their peers and discuss challenges. We hold these events in an actual retail space – where commerce happens. We met live at the Robert Graham store on Abbot Kinney in Venice Beach, CA to talk to three amazing brands – Birdwell Beach Britches, Sole Bicycles, and Karmaloop / Sheik Shoes. Each one has a story of transformation, maturation, and how to engage with customers who have endless choice. What better way to kick off the summer than with a Merchant to Merchant LIVE event in Atlanta? We kicked off 2018 with a live M2M event in Seattle and we’ve continued to take it on the road with our second stop in Atlanta. For those who aren’t familiar, Merchant to Merchant is a live event where merchants gather on a panel in front of an audience of their peers and discuss challenges. We hold these events in an actual retail space – where commerce happens. This month we traveled to Atlanta to the Citizen Supply store in the popular Ponce City Market. Citizen Supply’s goal is to bridge the gap between the maker and final consumer. They pride themselves in supporting local businesses, handmade and small-batch products, and sustainable businesses. We had a fantastic panel – three brands which represent community: King of Pops, a popsicle company that uses simple, wholesome ingredients, Bitter Southerner, an online editorial who also sells some pretty great merchandise, and So Worth Loving, a brand that breathes encouragement and support. They lent their voice to a conversation that has an interesting dynamic – how do you create community and change lives through ecommerce? What better way to kick off February than to hear from two experienced retailers on how to build and grow your business? And what better place to have our first Merchant to Merchant LIVE event than Seattle? Historically a New York-area event, SD was proud to bring the M2M show on the road this year. For those who aren’t familiar, Merchant to Merchant is a live event where merchants gather on a panel in front of an audience of their peers and discuss challenges. We hold these events in an actual retail space – where commerce happens. This month we traveled to Seattle to the Filson Flagship store. Filson is a historic brand which got its start as an outfitter for the Yukon Gold Rush. We had a fantastic panel – two brands which represent opposite ends of the seasonal product spectrum: Mervin Manufacturing, a historic snowboard manufacturer, and Espresso Parts, a primarily B2B-focus distributor of parts and service supplies for coffee shops. They lent their voice to a conversation we’ve been having here at Something Digital for some time – how do you combat the challenges of extreme seasonality in retail? Snowboards have very specific seasons where they’re in high demand. Then you have coffee – which has gone through the challenges of overcoming seasonality by generating customer demand through product innovation (think: cold brew and pumpkin spice) as well as international supply chain challenges. Beyond just creating new products and scaling your business horizontally – what can a retailer do? Listen as Daniel Nettleton and Trevor Phillips offer advice and give insight to how they’re overcoming these challenges. Click on the podcast below to learn more about overcoming seasonality challenges. Thursday, June 29th Something Digital and Magento hosted an Ecommerce Roundtable at Rothman’s in NYC. The roundtable was hosted by SD’s Phillip Jackson with guest panelists, Heather Kaminetsky (DreamLabs, LLC), Lee Bissonnette (Marc Fisher Footwear), and Julie Lefkowitz (Ramy Brook). Want to see what else the panelist had to say? Check out our podcast below or subscribe for future podcasts! On Thursday, June 29th, Something Digital and Magneto are hosting an Ecommerce Roundtable at Rothman’s in NYC. The roundtable will be hosted by SD’s Phillip Jackson with guest panelists, Heather Kaminetsky (Riley) and Julie Lefkowitz (Ramy Brook). Are you in NYC and looking for something to do that night? RSVP NOW! SD’s Phillip has an intimate conversation with Jon Azrielant – Director of Marketing of Richline, a Berkshire Hathaway Company – about going global and how Jewelry.com has thrived through various changes in the marketplace and consumer demands. Listen below to see what Jon had to say and don’t forget to subscribe to our podcast! Wednesday, February 8th, Something Digital and Shopify Plus hosted an Ecommerce Roundtable at Rothman’s in NYC. The roundtable was hosted by SD’s Phillip Jackson with guest panelists, Megan Petersen (Jack Rogers), Jake Danehy (Fair Harbor Clothing), and Ken Giddon (Rothman’s).